WINS THE 2018 ST ANDREWS PRIZE! 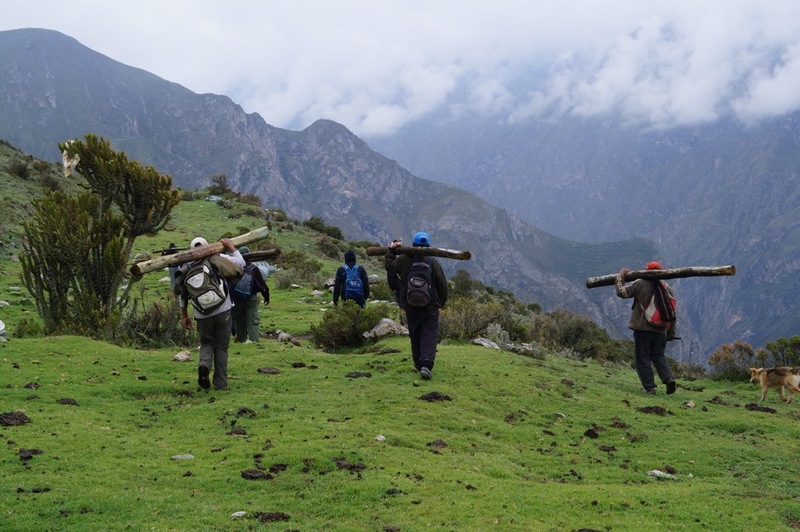 Miraflores, Peru: Community members carry posts for a fence to protect grasslands restored by a refurbished water canal. The Mountain Institute’s Restoring Ancient Water Technologies project in the Peruvian Andes is this year’s winner of the prestigious St Andrews Prize for the Environment. Selected from 190 entries from around the world, this project integrates 2,000 years of indigenous knowledge of water management with contemporary science and technology. The result is a set of hybrid solutions designed by and for remote mountain communities to address specific, local needs—especially related to water. By improving water security and supporting sustainable livelihoods, mountain communities become more resilient in the face of climate change. Humans and wildlife both benefit because water management is key to healthy mountain ecosystems. Throughout the Andes, highland people need to make their local source of water more secure as climate change and other factors threaten to dry and degrade high mountain grasslands and wetlands. Our new project builds on the success of the Ancestral Technologies and Climate Change initiative that helped restore wetlands, peatlands and grasslands in the puna ecosystems in the central Andes. By working as partners with the mountain communities of Canchayllo and Miraflores in the Nor Yauyos Cochas Landscape Reserve of Peru, we helped locals revive their ancestral water management systems. This initiative focused on repairing and restoring reservoirs, irrigation canals and other systems that were originally built by these communties’ ancestors as far back as 1,000 AD. The insights gained in Miraflores and Canchayllo were then incorporated into our work in the Cordillera Blanca of Peru. Through a collaboration with archeologists from the group PUNKU and geo-hydrologists from the University of Amsterdam, our team documented the use of ancient technologies in communities of the Cordillera Negra and Cordillera Blanca as part of our Securing Mountain Water and Livelihoods — a partnership with USAID. Reviving ancestral technologies in these remote mountain areas has improved the availability of local water and increased livestock productivity. This, in turn, has led to greater food security and economic benefits. The richness and abundance of biodiversity has also improved in the surrounding ecosystem, helping to make the puna, and all who rely on it, more resilient to climate change. With funds from the St Andrews Prize, our Restoring Ancient Water Technologies project can expand our current work to more mountain communities. The Prize will support our ability to co-design innovative solutions with mountain people for restoring cultural assets. It will also enable specialized training for communities when they apply for Peruvian government funds for their nature-based, community-designed solutions. Restoring Ancient Water Technologies is an integral part of The Mountain Institute’s Andes Program and our Scaling Up Mountain Ecosystem-based Adaptation Program which is part of the International Climate Initiative. This prize is also a recognition of our network of partners including the International Union for the Conservation of Nature (IUCN), of which The Mountain Institute in Peru (Instituto de Montaña) is a proud member. Link to video clip of St Andrews Prize announcement followed by short interview with Dr. Recharte.